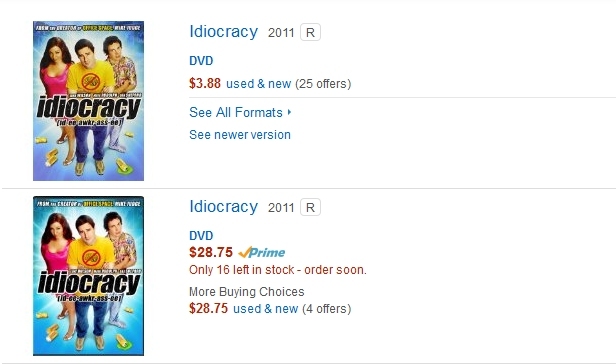 I’ve been kicking around the thought of ordering a DVD copy of Idiocracy for a while, so I’ve searched for it on Amazon a couple of times. What could account for that? It fits my theory that Amazon is trying to get people used to paying for shipping again and will move Prime exclusively to a content deliver service. 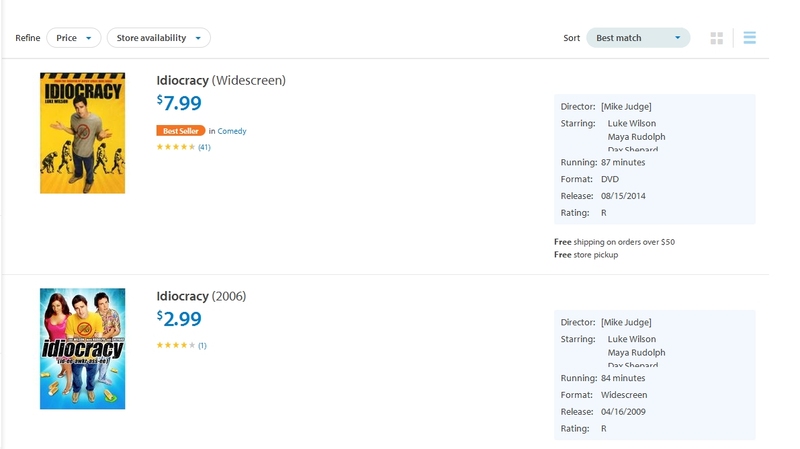 Here’s a bold prediction you’ll find everywhere else: Amazon Prime will evolve out of its actual benefit of offering free shipping on Amazon purchases to merely streaming content and giving its members exclusive access to a box that you can see filling up as you add items to your shopping cart. But undoubtedly Amazon will offer ship-to-store for free someday, just like every other retailer does now (and did in 1990). I’ve had conversations on the Internet with liberalesque people working in IT about government regulation and the excess thereof. I’m thinking in particular of a conversation I had a couple years back with a fellow I went to college with. My friend shared a post on Google+ about a software entrepreneur who said he heard a Republican candidate who said people weren’t starting businesses because of excessive taxation and regulation. The software entrepreneur said that was RIDICULOUS, HE was an entrepreneur, and this never entered his thinking! So I argued that software was a low-footprint industry, that you could start a software business with a laptop at the coffee shop, but that getting into other real-world businesses runs into a lot of regulation. I cited examples of renting a stall in a salon, which requires a certain amount of regulated training; opening an automobile garage, which runs into all sorts of Federal, state and local regulations and inspections; and a restaurant owner I knew who had to pass so many inspections that he blew through his seed money and ultimately spent more time trying to comply with regulations than he did actually cooking food for the public. I can’t link to the actual post since it wasn’t shared publicly, but rest assured, I was eloquent, self-assured, and presented a compelling case. Still, so many people in the industry I’m in harbor a certain shortsightedness about how government regulation chokes off the little guy (on purpose, often). Ward 5 Code Camp, which had planned to open Wisconsin’s first computer coding boot camp this month, has delayed its launch after a state agency said it had to register for regulatory oversight. The Educational Approval Board, a Wisconsin agency that oversees 245 postsecondary schools, approached Ward 5 in early December after hearing about it from another school it oversees. Ward 5 this month postponed discussions with the agency, but it said it is working to find a way to open. While on vacation in Florida last week and at the mercy of Garmin’s GPS app (at least until I sprang for a paper map of Orlando), I mentioned to my beautiful wife that I’d like a GPS app that not only gave you directions but would steer you away from bad neighborhoods in cities you don’t know. A new app uses crowd-sourced data to identify which neighborhoods can be considered “sketchy” or unsafe, but some people are saying SketchFactor may promote racial discrimination, according to PC Mag. Dagnabbit. I’m always a bit late to the party. And I don’t quite get Objective-C. Although, to be honest, my app would rely on police report data, not crowdsourcing. As a growing number of suburbanites and weekend farmers raise poultry for fun, not just food, they are learning that top health care is hard to find. In many cases, they are left to wing it. Hens, roosters and other poultry can have unique ailments that set them far apart from Fluffy and Fido. And even specialists well-versed on exotic birds may not know chickens, which are bred to be egg-laying machines. There are chicken experts: The American College of Poultry Veterinarians has about 260 members in good standing. But the vast majority work in the food industry, vets say. On the one hand, a chicken kick to the head won’t kill you. On the other hand, you’re more likely to get a type of influenza named like a strong password. All elites are good at rationalizing their elite-ness, whether it’s meritocracy or “the divine right of kings”. The problem is the mandarin elite has some good arguments. They really are very bright and hard-working. It’s just that they’re also prone to be conformist, risk averse, obedient, and good at echoing the opinions of authority, because that is what this sort of examination system selects for. The even greater danger is that they become more and more removed from the people they are supposed to serve. Since I moved to Washington, I have had series of extraordinary conversations with Washington journalists and policy analysts, in which I remark upon some perfectly ordinary facet of working class, or even business class life, only to have this revelation met with amazement. I once had it suggested to me by a wonk of my acquaintance that I should write an article about how working class places I’ve worked usually had one or two verbally lightning-fast guys who I envied for their ability to generate an endless series of novel and hilarious one liners to pass the time. I said I’d take it under advisement, but what on earth would one title such an article? . . . But many of the mandarins have never worked for a business at all, except for a think tank, the government, a media organization, or a school–places that more or less deliberately shield their content producers from the money side of things. There is nothing wrong with any of these places, but culturally and operationally they’re very different from pretty much any other sort of institution. I have seen this a little in the tech sector, too, where suburban kids who liked computers went to school for computers and then emerged on the other side of college as highly paid engineers who lived pretty good livings with somewhat skewed understandings of how things worked. In a lot of cases, our politics diverged quite a bit, too. I can’t help but postulate that moving in the insular world of technology, where things can just be done because you will them to exist through programming and where the government doesn’t put its thumb quite down on your livelihood (yet), might help envelop and cocoon people, too. Hey, speaking of my diverse employment background, check out this ten-year-old essay I’ve uncovered for you, gentle reader: Lessons from a Grocery Store. Also, don’t miss my currently running series Management Lessons From My Bad Bosses. Lowe’s wants an Internet sales tax. For fairness. Meanwhile, Lowe’s continues to build in developments within Tax-Increment Financing Districts, where the sales tax is often higher than surrounding areas. A Lowe’s home improvement store apparently will be the centerpiece of a development described in the city’s first official application to create a Tax Increment Financing district here. Town Manager Michael Chammings said he was disappointed with the decision by Lowe’s, after the efforts of Norway and Oxford to support the project. He referenced the approval by Oxford residents of a tax increment financing district for Lowe’s, which aimed to use captured revenue to improve municipal water service to the northern part of the town. Under a tax increment district financing plan, about $16.6 million of the property tax revenue from the center will be set aside to pay for infrastructure. The $105 million shopping center will have several anchor tenants, including Lowe’s, Target and Belk. Taken as a group, these ordinances establish a tax increment financing district and a business district to enable a St. Louis development company to develop a Wal-Mart store, a Lowe’s home improvement center, a housing development, and a strip center. Now, it seems to me that Lowe’s wants its fairness both ways: It wants fair treatment in special set-asides and special tax rates in places where it directly benefits from the unlevel playing field, where tax rates differ based on location within a municipality and where tax benefits accrue to those extra equal businesses helped by the local governments often at the expense of smaller businesses in the area who didn’t get helping hands in their development and who get additional competition from the government-assisted larger stores. Some developments get them, and it’s just not fair if the ones with the Lowe’s in them don’t get them, too. Lowe’s also wants the Internet fairness of making sure that its algorithms don’t have to calculate myriad tax rates whose myriad actually proliferates when Lowe’s wants to be part of a new development. In other words, fairness and “level playing field” have multiple meanings depending upon how they impact the corporation. Who has, apparently, an executive in charge of helping to manipulate legislation across the country to the company’s benefit. Lowe’s isn’t the only retailer playing this game, by the way. So I had a couple minutes to kill in my car, so I stepped into the local grocery store and looked at the magazine rack. It’s a small grocery store in southwest Springfield, right at the town line, and it has a 20 feet by 6 foot high magazine rack, with magazine selection from bridal to local interest to computers/video games to entertainment to… Lost Treasure, a metal detecting magazine that not only includes metal detecting equipment reviews and techniques but also short historical vignettes that describe the sources of potential treasure troves that metal detectorists can think about visiting. That’s the sort of thing I like to read, and it’s the sort of thing I like to write. The magazine rack held a number of issues, and I bought one and read much of it while killing that time in the car. And I thought: This is more amazing than the Internet. I mean, really: The modern paradigm is anyone can spend a couple bucks on a domain name and Web hosting and can put up any sort of thing he or she likes to write. But this particular periodical took a little more effort. I mean, someone put it all together, had it printed, had a distributor take it to various locations, and that distributor put four copies of this magazine in a grocery store for me to buy. It takes a lot of hope, risk, and infrastructure that blogging and other Web-based endeavors do not. That is more amazing than anything I’ve seen on the Internet. The union spokesman talks in terms of the electrical shop being an asset to the union. Let that sink in. And as the rest of us understand why this might have happened, we cannot tell the unions why their assets are disappearing. Because they don’t believe capitalists. So yesterday, I went to Lowes to exchange a defective piece of equipment (the aaftmentioned noise cancelling headphones and radio). I went into the special exchange room off of the main entrance, and the woman took my defective product and offered to refund the money to my credit card or give me store credit. Since I just wanted to exchange the product, I got a special store card credited with $53.83. I grabbed a new instance of the headphones and went to the checkout line, wherein the total rang up at $53.84, and the checker told me I owed a penny. On a direct exchange. I told him it was a direct exchange and prepared my outraged demand that he call the customer service desk right now, but he looked to see if he had a spare penny on the register. He didn’t, but I later noticed on my receipt that he’d rung it as though I’d given him a penny. He took a hit on his drawer’s accuracy at the end of the day in the name of good customer service. I sort of feel bad about that. However, not too bad. If I had bought other things, as I’d considered, that extra penny would have been lost in the total and I would have donated some portion of a penny to either Lowes’ bottom line or the state of Missouri and the city of Republic. A rounding error, no doubt. But the rounding errors are always against the consumer and the citizen, aren’t they? Don Carroll, a former financial analyst with a master’s degree in business administration from a top university, was clearly overqualified for the job running the claims department for Cartwright International, a small, family-owned moving company south of Kansas City, Mo. But he had been out of work for six months, and the department badly needed modernization after several decades of benign neglect. It turned out to be a perfect match. In the year 2OE, however, this is good news. To understand why jobs are so scarce, consider John McFarland and Nicole Rosen. The two share something in common: They’re reluctant to spend freely. McFarland is CEO of Baldor Electric Co. in Fort Smith, Ark. ; Rosen is a consumer in Washington state. Each is earning and saving money. Yet McFarland won’t hire until consumers spend more. And Rosen won’t spend more until jobs seem secure. Therein lies the standoff that helps explain the weakness of the recovery and the depth of the jobs crisis. Each side — employers on one, consumers on the other — is waiting for the other to spend more. Until then, the recovery will likely feel shaky. And job openings will be few. Well, then, there you have it. What side is missing from this love triangle? Oh, yeah, and increasingly fickle government whose new Department of Weights and Measures exists to put thumbs on scales to determine the winners and losers. MfBJN EXCLUSIVE! Must credit MfBJN! Amazon’s publicity intern here throws out a particularly loaded aside. A MONOPOLY! That’s a bad thing, Pavlovian dogs: salivate! Except Macmillan has a monopoly over its property. Its intellectual property, but it owns those titles, sort of, after investing money in them and getting a contract. Since Amazon is against companies having monopolies over their intellectual property, I can only assume that Amazon is releasing all of its source code and is transferring all of its patents to the public domain, immediately. Otherwise, Amazon is in its own terms a no-good dirty monopolist. I was going to say, “Ain’t it funny that,” but it’s really not funny that the black paintbrushes come out when someone is not freely sharing his property with the namecallers. Information wants to be free! and all that business. Health care wants to be free! None of that crap wants anything on its own. People without it or without enough of it want someone else’s, pure and simple. I have the urge at this point to throw out From each according to his ability, to each according to his id, but many people would think I’m going off the deep end. It’s a steady erosion of cultural justification of property rights. This little message from Amazon and its tossed off use of a trigger word for some small sympathetic effect is a little thing, but a lot of little drops melt stone. Like The Dilbert Principle, this book is not a mere collection of Dilbert cartoons, although it includes a number. Instead, it’s a text derivative of the world inhabited by Dilbert, Dogbert, Catbert, Ratbert, Alice, Tina, Wally, Pointy-Haired Boss, Asok, and so on. This book takes the schtick of being a handbook for managers from Dogbert, the evil genius. Within, you find that it explicitly tells the executives reading how to behave as a Dilbert executive should. Sadly, although the book is 12 years old, the behavior seems timeless. Fortunately, that means the humor is fresh, and you can laugh cynically. Or you can take it to heart and thrive as an executive. Companies are aiming to apply traditional ROI and business benefit measures to Web 2.0 tools despite the difficulties in measuring the “softer” returns, such as the improved productivity and communication that wikis, blogs and RSS bring to a company, a new survey has found. There are tangible business benefits, such as a drop in support center calls because of rich Internet applications or a database system replaced by a corporate wiki, according to the Forrester Research Inc. study released this week, but they remain elusive for most IT decision-makers. Instead, most companies point to softer benefits, such as business efficiency and competitive advantage as the true value from Web 2.0 technology, according to the report. That is, it’s hard to use one buzzword metric to justify a buzzword technology/architecture/whatever-the-hell-Web-2.0-is. However, if you’re going to define the terms and the very principles of accounting, no wonder you’re going to come up with the solution you want (which is: Web 2.0 is worth spending money on, particularly if you’re going to spend it on us/the people who commissioned the study). Hey, I won’t knock it; I am in a profession whose benefits are hidden but whose lack is obvious. But I have a hard time selling on benefit/analysis kinds of things MBAs like. I have to try to sell it on do it right, and the customers will come. In their divorce proceedings, in which Deanna Vinson got custody of American Equity Mortgage and Ray Vinson retained rights to his, erm, unique radio voice (“Ninety-nine, ninety nine!”), the former Mrs. Vinson and her attorneys asserted that her stewardship of the company, not the, erm, uniqueness of the ubiquitous pitchman, were responsible for the company’s success and millions of dollars in income. American Equity Mortgage is closing its offices in seven markets due to a slowing in the home mortgage business, President Deanna Daughhetee confirmed Friday. Meanwhile ex-husband Ray has set up shop with his own mortgage group and his curtain-of-fire radio commercials with a similar phone number that ends in 9999. Maybe Ms. Daughhetee can halt the decline by snapping up Granny from Homestead Financial when she becomes an unrestricted free agent and putting her onto the air on American Equity Mortgage’s behalf. If Garth Snow doesn’t snap her up to shore up the Islanders’ blueline first. Last month, SalesForce.com had its IPO. This month, the first shareholder lawsuits were filed. If I weren’t laughing, I would be crying. An entrepreneur from Edwardsville is weaving a network of basket makers from some of the world’s poorest countries to create a business that combines spirituality and fair trade. The 150 weavers that the Blessing Basket Project is working with around Kampala, Uganda, were paid $12 for a set of three baskets – three times more than typically offered. The weavers – mostly female subsistence farmers – are able to buy milk and meat for their children as well as books and uniforms for school. So, they’re paying $4 each for these baskets and selling them at $25 to $35 each. I am sorry, that looks like a 500% to 700% capitalist imperialist dog mark-up to me. Of course, I’m not against capitalist imperialist dogism, but I do think that the Post-Dispatch likes to assail corporations who would do this, particularly those that use third world labor to do things formerly done by unionized US workers. I guess the difference is that software and automobiles aren’t sold at Whole Foods Market.